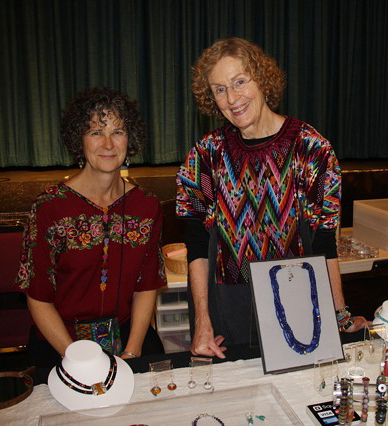 Ann Brooks and Jeanmarie Nutt (seated left) at the De Young Museum’s 2011 Ethnic Textile Bazaar in San Francisco. Sunday, for the second year, I participated in the De Young Museum’s Ethnic Textile Bazaar, selling my ethnically inspired jewelry from my World Peace Collection. Book and fiber artist Jeanmarie Nutt was, again, a great assistant. In the spirit of the day, we both wore Guatemalan hupiles we had purchased in Oaxaca. Mine is an “eagle” style from the village of Chichicastenango with it’s sunburst around the neckline. Some of my most popular items at the Bazaar were my Tibetan Buddhist mala earrings, and red vulcanite (vinyl) bracelets from Africa, one with turquoise, Baltic amber and Tibetan mala beads, and another new design, red with black and “silver” Fulani tribe prayer beads from Africa. You can see more of my jewelry at www.annbrooks.net or in my online zibbet shop.